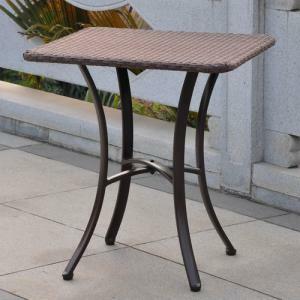 A patio bistro table is a nice addition to your patio and great for entertaining guests. There are many styles to consider before choosing the best fit for your lifestyle and design preference. Bistro tables with glass tops are an excellent patio table choice for a small space. Unlike a solid table top, a glass top gives the illusion of a larger area. You can add a glass top table without making the patio area feel overcrowded or cramped. The glass is easy maintenance and makes a quality outdoor table. Candlelight reflects against the glass top and adds ambience to any evening soiree. The 26" Round Hadley Bistro Table is made from powdered coated steel with a tempered glass top. You can purchase online with free pickup at your local store. Customers like their purchases with comments including, "Nice solid table easy to assemble" and "Nice little table." It's priced around $25 with local pickup. This table design goes well with a modern style and is ideal for an industrial style patio. This urban chic design can always be transformed with a simple tablecloth to fit the occasion. 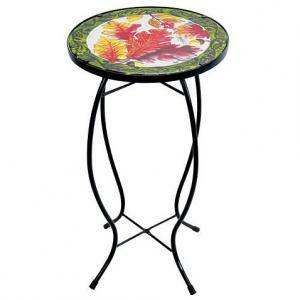 The 12" round Exhart Fall Leaves Glass Outdoor Bistro Table is hand-painted and sets on a metal stand with curved legs. Weather resistant, the table is 21" H. Get it for around $33 plus shipping. This table is destined to be a conversation piece. Only one foot in diameter, it's a cute addition to any patio setting that's contemporary, eclectic, bohemian or woodland themed. Use it with a pair of bistro chairs to hold drinks during a summer party. Set in a corner for a cozy touch. A tile top bistro table adds a romantic touch to a patio with an old world charm. Set it in the corner surrounded by tall potted plants and smaller pots and/or flower boxes filled with colorful flowers. Suspend a pendant lamp or a string of bulb lights above the table. The Coral Coast Terra Cotta Mosaic Bistro Table is 30"W x 30"D x 28"H and features a hand-laid terra cotta tile top with charcoal gray grout. The tabletop design features embossed floral, leaf and broken tiles. The black powder-coated iron frame is made from tubular steel. It costs about $150. Overall customers are pleased with the table with several commenting how well the table was packaged, although one customer had to reorder and wasn't pleased with the replacement. However, most customers commented positively, saying, "easy to put together" and " looks much more expensive than pictured online". An ideal choice for a Mediterranean, Spanish or Southwestern home style as well as many contemporary ones. Make a bolder statement by adding various sizes and styles of terra cotta potted plants and flowers. Select a pair of wrought-iron chairs and use a terra cotta and blue striped cushion or seat upholstery for a striking complementary color combination. 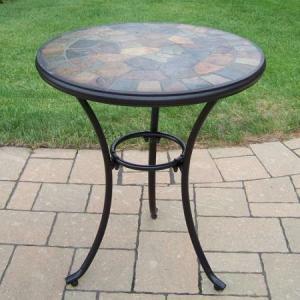 This 24" round Oakland Living Stone Art Patio Bistro Table is 29" tall. It's made from hand-cast tubular iron and is rust-resistant. The coffee-colored finish is a hardened powder-coat and is chip, fade and crack resistant. The top is made from natural stone. Buy it for less than $160. This table is a great look for any rustic, country or contemporary patio style. If you have a mountain home or vacation cottage, tuck this table in a corner along with a few well-placed stone tile candle holders and stone mosaic planters and pots. The 28" Square Cadiz Outdoor Bistro Table is 30" tall and sets on an iron frame with a powder-coated finish. The mosaic top design is made from hand-placed glass tiles. Some tables will result in slight variations due to being handcrafted. You'll need to store the table during inclement weather. Customers are very pleased with their purchases. Some customer comments include, "Table is absolutely beautiful, as pictured" and "The table top is heavy and the stand is sturdy." Get it for about $130 and a shipping fee. This festive table is a great addition to an eclectic, contemporary or modern patio decor. Add other glass mosaic objects such as a vase, candleholders, serving pieces, a water fountain or other decorative objects. Add pillows and cushions that repeat the colors in the table. A scroll-work metal table can add grace and created a feeling of movement and form to a patio decor. 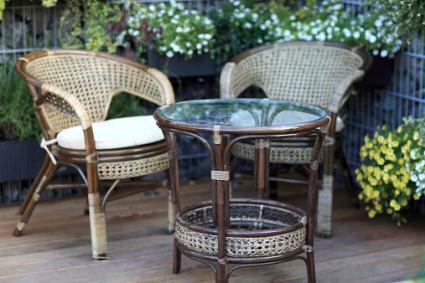 If your design style is French, then you can continue it onto the patio with an elegant and ornate metal bistro table. The 42" Darlee Darlee Round Patio Pedestal Bistro Table is part of the Series 60 collection and 21" tall. The tabletop is 100% cast-aluminum and features a unique swirling crisscross pattern. A removable umbrella hold cover comes with the table. The base is made of cast-iron. Both are rust-resistant and available in either a Mocha or Antique bronze finish. Buy this larger bistro piece for approximately $630. This style will bring out the whimsical for an eclectic patio decor. It's also versatile enough to be used with most contemporary styles. Add a few other metal artwork and candle holders to repeat the scrolling design. The French style Deer Park Ironworks Imperial Bistro Table is 24" in diameter and features a mesh metal top. The 30" high metal table has a powder-coat in a natural patina finish. It costs about $100. One customer commented that the patina color is darker than what is shown in the photo; however, was very pleased. The customer purchased a glass top so she could use it for a "writing/telephone center and to put puzzles together." An elegant choice for any European design style, especially French architectural homes. Add several glazed and rustic potted flowers to complete the ambience this design brings to your patio decor. The 30" square pedestal Woodard Wrought Iron Bistro Table is available in 30 powder-coated color finishes. Hand-formed, the table is cast and tubular aluminum. It's priced under $450. This table style makes a great addition to a modern or contemporary patio design. Also, if your decor style is industrial, this table would make an ideal choice for extending that look onto the patio. A country or cabin style patio is just waiting for a woven wicker bistro table to complete the look. A lakeside home patio makes a great setting for a wicker bistro table. Add a couple of other wicker pieces to finish your patio decor. This 28" Square Barcelona Bistro Table is 30" tall and made from wicker resin. Part of the Barcelona collection, this powder-coated aluminum frame is available in antique brown, black antique or honey finish. Wayfair customers are very pleased with their purchases. Some comments include, "Weave is nice and tight" and "Easy to assemble." and one customer commented that the table was "very, very light." It's about $160. This bistro table can be used with several design styles, including contemporary patio decors and rustic designs. If you're using a woven jute rug, this table will easily repeat that texture look. Suspend a woven style pendant light over the table and add a similar candle holder for a cohesive look. The table features a woven resin wicker top with a shatter-resistant glass. The table comes with a 3-year warranty. Pricing range is in the $700s. This table is a mix of wrought aluminum and wicker that gives it a versatile design appeal. You can use it with a strictly wicker ensemble or with a contemporary patio design. Add wicker or wrought aluminum chairs. A wood top bistro table can be used with many design styles, especially a contemporary one. Some wood top table styles are great matches for modern home designs as well as rustic. You can dress up a wood table by added a colorful tablecloth. The Sabbattus Wood Patio Bistro Table is a 35" square and is 30" tall. Made from premium balau (similar to teak) hardwood, the table is finished with a premium dual stain finish that protects it from the weather and fading from UV light. The table top features an inlay of slats that create a slat-like design. An umbrella hole is in the center of the tabletop. The table is supported by strong curved legs. Customers say they "Love the color of the wood" and that "This is a quality product." Pick it up for about $210. You can use this bistro table with many designs, such as contemporary, rustic, Asian or lakeside home styles. 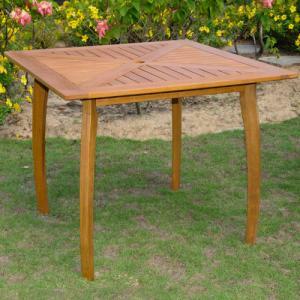 If you have existing teak wood furniture, this bistro table will mix well with most teak furniture pieces. Use a contemporary umbrella with this table. A solid green will highlight the wood finish. 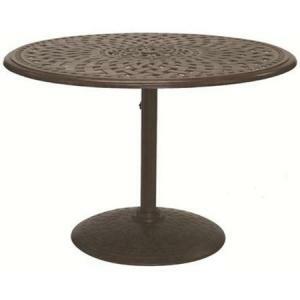 The 38'' round Tommy Bahama Outdoor Tres Chic Steel Teak Bistro Bar Table is a special order item. It ships within 4-6 weeks. The table is 42.25" tall and is sculpted with a hand-rubbed finish. The brushed stainless steel curved vertical supports feature two rings that create a stylized contemporary design. The wood top is comprised of curved teak slats that create a stylish look. The table is all-weather and rust resistant. It costs a couple thousand dollars but has free shipping. This couture look goes with any chic patio design. It goes well with a contemporary or Asian furniture style. Matching curved sculpted chairs are also available to complete the look although you could easily use other brushed steel chairs with wood features. A bistro table provides more than an additional hard surface; it gives a great visual change that translates in height and depth to your patio design. Guests can either stand or sit around this quaint table. Add other design elements to make this feature blend naturally with the rest of your patio design.